Are we soft these days? Do we have no adventure, no entrepreneurial spirit? It is hard to compare people from different eras, simply because circumstances are always vastly different, but I cannot help but wonder at the risks people took in earlier generations. Take migration, for example. Australia was built on the arrival of people from other lands, both forced and unforced, and it continues to this day. When I was at school in the fifties and sixties, I knew lots of families who had uprooted their lives and transported themselves to Australia in the hope of finding better opportunities. I always marvelled at their courage, because I figured that you couldn't possibly know how it would turn out. Here's a story of an early migrant who made good, one James McWhirter, who arrived in Brisbane from Scotland around the year 1880. He was firstly employed by merchants DL Brown & Co, then struck out into his own drapery business with some success, such that he sold up and returned to Scotland. Why he became restless there is uncertain, but he returned to Brisbane to work in the drapery business of Mr TC Beirne for a period, before eventually becoming Beirne's partner. In 1898, his entrepreneurship led him to once more set out on his own, and he established the drapery firm of McWhirter and Son in a small Brunswick St premises, employing thirty people. A strong work ethic and undoubted commercial acumen enabled the business to expand fairly rapidly. A mail order department was established to enable the store to serve country customers, and McWhirter & Son then had to expand physically by buying adjoining premises in Brunswick St. This was still insufficient, and a new five-storey building was constructed for the company in 1912, on the corner of Brunswick and Wickham Streets. Despite World War I, Brisbane flourished, and with it McWhirter & Son also continued to develop. Then James McWhirter Junior died suddenly whilst on business in Sydney in 1917, and the firm's founder James Senior died in 1925. However, the store had floated as a public company, McWhirters Ltd, in 1920, and the strong relationship that the company had developed with its 800-strong staff enabled further success. Expansion into clothing manufacture followed, and the development of "The Valley" into Brisbane's department store precinct ensured a competitive but profitable business environment. The next step was the construction in 1930-31 of the Art Deco store designed by Hall & Phillips, who were the architects of Brisbane's City Hall. 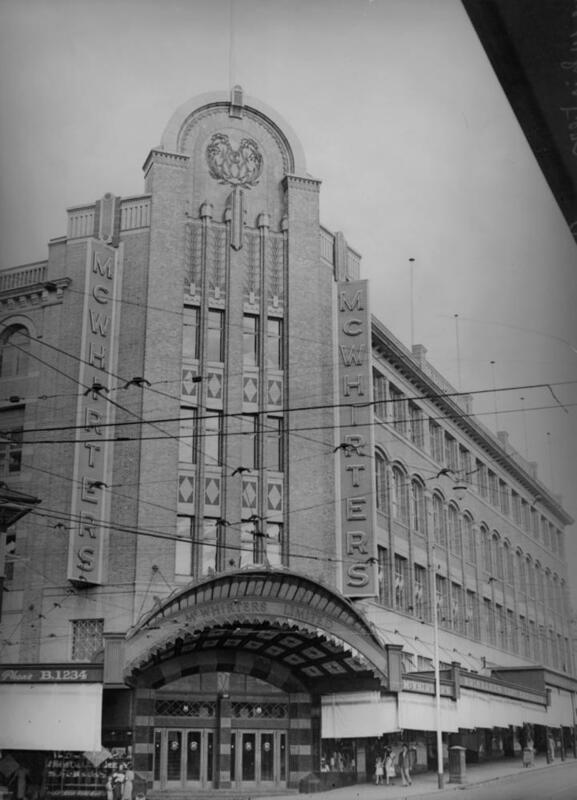 McWhirters maintained its position as one of Brisbane's major retailers through to the fifties, when it was taken over by the southern emporium, Myer, which ran it as a department store until 1988 by which time the suburban shopping malls had ended the Valley's days as the retail hub of the city. The site was sold, and transformed into a combination commercial and residential complex. This is how the building looks today. Almost one hundred years of service to the people of Brisbane, the employment of hundreds of local staff, and one of the city's landmark buildings. All originating from one entrepreneurial Scottish immigrant - James McWhirter. This is one of my favourites. The outside is still spectacular - it's a shame the Art Deco-ness doesn't continue inside in that dingy shopping centre... Having said that, there's a little Indian cafe inside that does the best vegetable samosas in Brisbane! Ha- not to be picky but the samosa shop is in the arcade adjacent to the actual McWhirters building. Indeed, their samosas ARE the best in Brisbane. My first job after art school was as an advertising cadet at McWhirters, the ad department was on the roof of the building along with the show rides that were gassed up at Christmas. Myer's it was in those days (late1960's) also owned a large warehouse in the back street, the 8 story one beside the church that is now a black-painted disco. My mother (in Wagga Wagga NSW) has a friend who I've known all my life. I never knew her by her first name, let alone her full maiden name. She told me tonight, her maiden name is McWhirter. "Oh," I said, "There's an historic department store in Brisbane called McWhirters". "I know," she said, "that was opened by my great uncle!" And we sat all night talking about it. I lived in Brisbane for 13 years, and know the building well. Its such a small small world! The first three photos belong to the State Library so I cannot sell them. If you go to the Library's site you will find their conditions of use. The last image is mine and may be used in a non-commercial manner as long as it is credited to this blog.